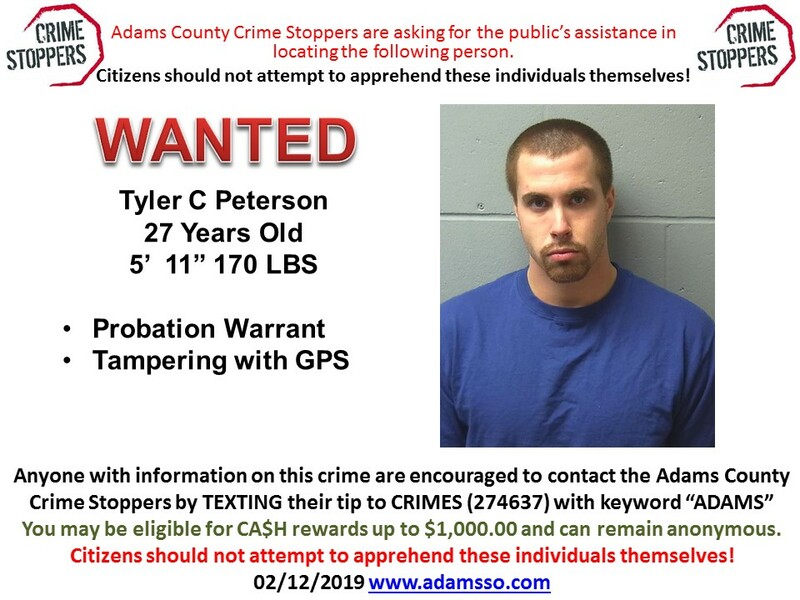 Adams County Crime Stoppers are looking for help in finding a wanted person. They are looking for 27 year old Tyler C Peterson. Peterson is a 5’11 170 pound white male. Peterson is wanted for GPS tampering and probation warrant. Anyone with information on this crime is encouraged to contact the Adams County Crime Stoppers by texting their tips to 274637 with key word ADAMS. You may be eligible for cash rewards and can remain anonyms. Citizens should not try to apprehend these individuals themselves. This entry was posted by WRJC WebMaster on February 13, 2019 at 10:03 am, and is filled under Local News. Follow any responses to this post through RSS 2.0. Both comments and pings are currently closed.